MRAM developer Crocus Technology developed a new MRAM-based magnetic sensor that can be used to detect the shape and bendability of flexible displays. The idea is that you place a sensor every 5 cm or so (depending on the display size and bending radius) and this allows you to determine whether the display is bent and in which way. 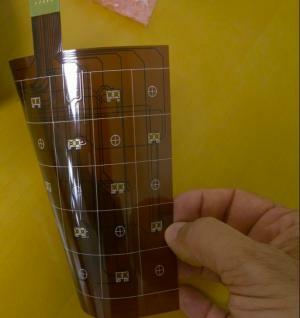 A flexible sensor such as this can be used to correct the image that gets deformed when bent. It can also be used potentially for UI purposes - similar to Nokia's Kinetic prototype phone shown in 2011. Crocus says that it can provide a thin film embedded with those sensors. The film can be attached to the display's substrate. Crocus is in talks with several Asian corporations - which were very interested in the technology. Truly bendable OLEDs will only arrive at 2016 at the earliest. In 2015 we may see foldable OLED panels from Samsung, but these won't need such a sensitive sensor as these panels can only be folded in the middle. The company discovered a technique to turn their MRAM memory cell arrays into very sensitive magnetic sensors that have a much larger range than any commercial sensor. The production process is very similar to the MRAM process the company uses, but with a different cell design. Basically it is a very simple sensor that detects changes in a magnetic field from a perpendicular magnet. Crocus is also working on a design that combines the sensors with MRAM devices on the same circuit. This will enable very efficient image display calibration (which requires a small amount of memory).